Having now covered all the various levels of the DSWA Craftsman Certification Scheme I thought it may be useful to just finish off with a final round up of the scheme including some thoughts and comments that people have made regarding the scheme. The DSWA office is continually fielding questions and enquiries regarding the certification scheme from both perspective candidates and also from wallers who have already embarked on the certification scheme. The answer to most of these enquiries can be found in the DSWA craft skills booklet and I would urge every perspective candidate to familiarise themselves with its contents thoroughly. If further clarification is required the DSWA office can offer advice while more complicated enquiries will get forwarded to the DSWA Craft Skills Group (CSG). 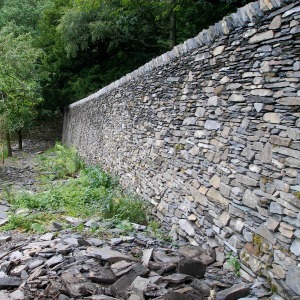 The CSG comprises of a chairman,the DSWA training and education officer, four DSWA examiners (including myself as chief examiner), a representative from LANTRA ( the DSWA’s Craftsman Certification Scheme’s awarding body) and a representative from a college or educational establishment that offers training in dry stone walling. The CSG meets quarterly, usually a month before the DSWA trustees meet for reporting purposes. The CSG is also responsible for the day to day administration of the scheme and dealing with any complaints regarding the scheme. Again information regarding the complaints procedure is contained in the DSWA Craftsman Certification Scheme booklet. I would recommend, as well as familiarising themselves with the test schedules in the DSWA Craftsman Certification booklet, that all candidates consider taking a trial test day. This will offer the candidate a chance of a “dummy run” under test conditions, this experience is in my opinion invaluable. Not only will this help the candidate understand the test procedure and time constraints but it will also enable them to assess whether or not they are indeed ready to take a test at that level. Most DSWA branches can arrange trial tests at one of their scheduled training days or alternatively the DSWA office can offer advice on how to attend such an event in your area. Most candidates embarking on the DSWA Craftsman Certification Scheme will at some point have to deal with the issue of time constraints. Working against the clock does not suit everyone and indeed the biggest criticism of the scheme is that all the practical elements, other than the advanced and master’s features, are timed. In defence of this the DSWA has always stood by it’s decision of running timed tests, as it is the only way to prove a candidate can build to a pre-determined standard at a commercial rate. There is no merit in a professional qualification that allows a candidate an open ended period in which to complete their exam, it must be a pre-set quantity of wall, to a pre-set standard, in a pre-set time scale. As I have said before what other exam board would allow an invigilator to enter an examination hall and say to the examinees ” you just all take as much time as you like, I don’t mind how long it takes”. I am aware that some of my comments from previous blogs on this issue have been perhaps misunderstood or misinterpreted. To put the record straight, when I have advised candidates to drop the quality of their work slightly to enable them to work a little faster, I do not mean for them to produce inferior work merely work at the standard required by the level of certification they are being examined at. It is human nature in an exam situation to try and produce the best work you are capable of when actually there is no point trying to work at an advanced level, if you are attempting an intermediate test. If you are trying to produce work above your skill level it will take you longer and you will run out of time. In short produce work at the level the examiners are expecting at the level of certification you are attempting. All levels of the DSWA Craftsman Certification Scheme are attainable as the pass rates bear out. Last year at Initial (level 1) out of 105 entered for the examination 91 were successful, at intermediate (level 2) out of 80 entered 62 passed, with 2 out of 4 passing advanced (level 3) and 1 out of two passing the master’s test. These figures indicate a healthy interest in the DSWA Craftsman Certification Scheme and more importantly in the craft of dry stone walling itself. Anyone who has successfully completed any level of DSWA certification can be proud of their achievement and hopefully they will aspire to continue their journey up the certification ladder as far as they are able. Next time I will be starting a series of blogs about the DSWA Pinnacle Award Scheme. As well as an overview of the scheme and how it operates I shall describe some of the work I have successfully submitted for scrutiny under the scheme.